JARS FROM VIGAN. One day my father brought home from Vigan a car load of burnay jars. The old dark earthen jars that came in different sizes and forms, even the purposely deformed ones stayed in our garage for a while since we have no use for them until I decided to place the miniature jars in our aquarium. Together with live aquatic plants, lava rock, driftwood, and the different tropical fishes, the display in our aquarium looked like an underwater ancient site or remnants of a shipwreck. We allowed green moss to grow over the burnay jars making the arrangement look more natural. It was lovely. BURNAYAN. 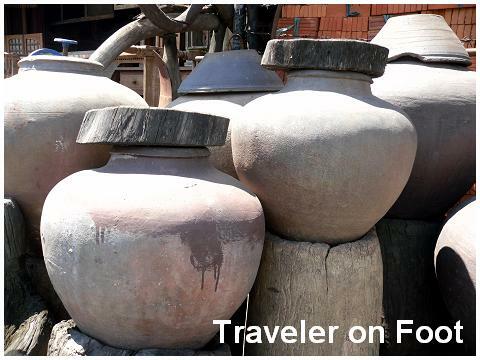 When we visited Vigan, we went to the place where these burnay jars were made. Burnayan is a potter’s village where from a mound of tight sticky clay dug out from the riverbank, the dark and heavy burnay jars are individually shaped by-hand on a potter’s wheel and fired in an open kiln. Old time potters claim that burnay is the first jar their ancestors ever made. Traditionally, burnay potters have always stayed around Vigan because they believed that this is where their ancestors lived and had taught them the art of burnay-making. BURNAY IS HEAVY. The smallest burnay jar packs a sturdy weight. These earthenware is heavy because it is a closed, tightly packed jar which is kneaded and pounded over and over to make it air-tight. Fine gravel, sand, and ashes are mixed into the clay. All these make the burnay heavy and very sturdy. Unlike clay pots that are light reddish brown, the burnay is darker because it is smoked before the potters work on it. Burnt clay is added to the clay mix and as the burnay is fired, smoke is allowed to run through the jars. ILOCANO TRADITION. Just as generation of potters did before, each burnay jar is formed by hand. The potters maintain the design simple. Sometimes potters put a curly lay around the shoulders of the jar or prick the jar using a stick while it’s still soft to make the jar little less plain. It is a tradition in Ilocos to buy burnay jar only in Vigan. But unlike the clay pot palayok and the balanga, the burnay is never used for cooking or for keeping drinking water like in the case of the versatile tapayan. Burnay jars are too thick to hold heat and since it’s airtight water does not get cool enough to drink. So burnay jars are used to ferment bagoong and the sukang Iloko. It is said that the sugar cane wine called the basi will not turn into a potent drink if it is not stored in a burnay jar. EPILOGUE. Just like with other Classic Filipino Kitchenware, the burnay jars are hardly ever used today for storing food and drinks. They have ended up in antique stores and the really old ones have become heirloom pieces. For my father, bringing home those charming burnay jars from Vigan is like linking us to his Ilocano roots.